The universal language of business, commerce and finance, accounting is perfect for students with a good head for numbers and analysis, a driving interest in business and a keen eye for detail. Accounting degrees involve learning how to measure, process, analyze and communicate financial information about an organization to a variety of concerned parties, including investors, creditors, management, regulators and the general public in order to facilitate improvements and adherence to established rules and guidelines. But first, what is accounting? Accounting is the process by which financial information about a business, organization or individual is recorded, classified, summarized, interpreted and communicated. Drawing from fields such as information technology, law, statistics, business and economics, accounting is a multidisciplinary subject that focuses on an organization or individual’s economic activities. There are many different types of accounting degrees, with undergraduate-level titles such as Bachelor of Accountancy or Bachelors in Accounting. The specialized Bachelor of Accountancy (BAcy, BAcc or BAccty) in the US is often the only undergraduate degree recognized in the country for subsequent practice as a professional accountant – in that respect, it works as a first professional degree. Elsewhere, accounting degrees may be offered as a Bachelor of Arts (BA) in Accounting, or as a Bachelor of Science (BSc) in Accounting (also abbreviated as BS/ACC). Meanwhile, South Africa offers undergraduate accounting degrees titled Bachelor of Accounting Science (BAccSci) and Baccalaureus Computationis (BCompt). While many universities offer undergraduate degrees with a sole focus on accounting, it’s also common to find accounting offered alongside other subjects (most commonly finance, economics or business management) in a joint-degree format. There are also general business degrees with a focus on accounting such as the Bachelor of Business Administration (BBA) in Accounting and the Bachelor of Commerce (BCom) in Accounting. Most accounting degrees are accredited by a relevant professional body for accountants at the national level. Examples include the UK-based Association of Chartered and Certified Accountants, Institute of Financial Accountants and Chartered Institute of Management Accountants, and the American Institute of Certified Public Accountants based in the US. Studying an accredited degree allows graduates to apply to the relevant body for exemptions from certain exams once they start working towards chartered accountant status. Those applying to study accounting are usually required to demonstrate a strong background in mathematics, while those who have taken courses in statistics or business will be at an additional advantage. Some universities allow students to switch between accountancy programs after their first year, to choose a track that best matches their interests and abilities, following their general introductory courses. Generally, undergraduate-level accounting degrees last four years in the US, three years in Singapore, the UK and Australia (and most other countries), and two years in Malta provided the student has obtained exceptional grades in a Bachelor of Commerce degree. In the first year or half of their degree, students will be introduced to key topics within accounting, finance and business. They can then choose to specialize in particular accounting topics and that interest them, contingent on the institution’s available modules. Students generally work towards completing a major research project, with other assessment methods including reports, group presentations and portfolios. Teaching is usually classroom-based, involving individual and group exercises, case studies, lectures, seminars and IT workshops, including the use of accounting software. Most institutions provide teaching staff with professional experience in the accounting and finance sectors, while many also allow students to spend a year on an industrial placement, gaining valuable work experience, language and accounting skills and professional contacts, either locally or abroad. Accounting degrees commence with a general introduction to foundational accounting topics such as accounting systems and services, accounting techniques and software, accounting theory, auditing, financial accounting, introductory topics in business, IT skills, macro- and microeconomics, management accounting, statistical, quantitative and mathematical methods, and taxation. You’ll then proceed to more advanced accounting topics within those fields, and be able to choose further modules in a range of specialist areas such as business strategy, business and employment law, advanced accounting theory, forensic accounting, financial planning, risk management, behavioral economics and international taxation practices, to name a few. A major branch of accounting is financial accounting: the collection, recording and analysis of financial information in order to periodically summarize this information in financial reports and statements, in accordance with legal, professional and capital market requirements, to external users (usually decision-makers such as investors, government agencies and suppliers). Another major branch of accounting is management accounting (or managerial accounting) which involves the measurement, analysis and reporting of accounting information for internal use within organizations. This confidential information is only discussed internally and allows managers and other decision-makers to make informed decisions to control the functions of their business. Auditing involves analyzing and assessing a company or organization’s financial statements, creating a plan and documenting a financial activity file. You’ll learn how to investigate and examine data, statements, records, operations and performances of an organization for a stated purpose. You’ll also learn how to evaluate this objective evidence and use established procedures in order to formulate a judgment and communicate this through an audit report. Courses in taxation and tax accounting involve learning how to interpret tax information and how to apply accounting principles to tax purposes as prescribed by tax law. You’ll learn about the history, laws and policies of taxation and basic concepts such as gross income, exclusions, adjusted gross income, deductions, exemptions and credits. There may be several specializations within this topic, for example: corporate taxation, individual/estate taxation and federal income taxation. “Forensic” means “suitable for use in a court of law”. Thus, forensic accounting is the use of accounting principles to a specified standard in order to present findings at a court of law. Students will learn how to collect evidence, provide legal support and testify in court. You’ll learn about the legal aspects of accounting, about accounting fraud investigation and prevention techniques, and gain a thorough understanding of the rules and regulations established within forensic accounting. 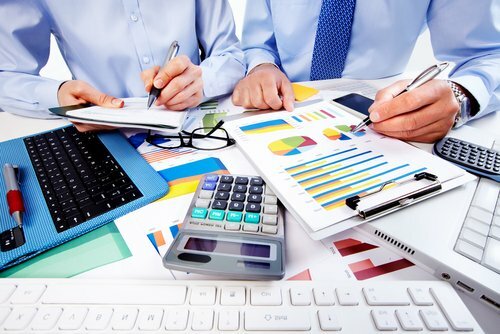 Other accounting courses you may come across during your studies include: accounting information systems, business strategy, corporate reporting, cost accounting, data analysis, economics and management, financial analysis, government and non-profit accounting, international accounting, macro- and microeconomics, professional standards and ethics, quantitative analysis, reporting procedures, risk management and strategic management. Accounting is one of the most popular degrees for students and employers alike, due mainly to the relevance of accounting for all businesses and individuals across all industries and sectors, in order to maintain financial stability and achieve financial success. Qualified accounting professionals are thus in high demand across the board. While a master’s degree or its equivalent is required for the more lucrative accounting careers, graduates of accounting degrees typically go on to work in entry-level positions as accountants or pursue professional accountant status. This usually involves taking up “articles” or work experience positions at an accredited accounting firm, working in one of the specialist roles within accounting. Many accounting graduates seek positions at the ‘Big Four’ audit firms, Deloitte, PwC, Ernst & Young and KPMG, which comprise huge international networks of professional service providers. Many organizations make use of and provide support for trainee accountants as they work to achieve chartered status. Usually, a three-year salaried contract is agreed upon, with the student needing to complete a certain amount of work experience, take accounting courses on ethics and other relevant subjects and pass some examinations. You’ll typically spend your time preparing and auditing accounts, collecting raw data, analyzing receipts and payments, curating details of creditors and debtors, and monitoring and forecasting bank balances. You may need to liaise with investors, deal with phone queries, process accounting records and even set up new investments. An accountant is a fully-qualified practitioner of accounting (or accountancy). As you’ll be working for a professional accounting body, you’ll need to maintain certain standards of practice, including adhering to the generally accepted accounting principles (GAAP) – rules set by various standard-setting organizations such as the Financial Accounting Standards Board (FASB) in the US and the Financial Reporting Council (FRC) in the UK. There are three typical types of accountants: public accountants who work for public organizations or individuals; management accountants who work for private companies and are also known as private or cost accountants; and government accountants who work for federal, state, local or national governments. Typical work activities include managing financial systems and budgets, providing financial advice, undertaking financial audits, liaising with clients, performing risk analyses and detecting and preventing fraud (forensic accounting). An auditor reviews financial accounts of companies and organizations in order to ensure the validity and legality of their records. You’ll be involved in collating, checking and analyzing financial data, examining a company’s financial control systems, taking risk analyses, ensuring accurate and reliable financial records, creating safeguards for the company’s assets, creating reports, commentaries and financial statements and making recommendations for improving processes. There are two main types of auditors: internal and external. Internal auditors usually work in the private sector, while external auditors deal mainly with taxes and the government, but may be called to examine finances of private businesses that work in association with governmental bodies. You may work in accounting departments, within independent chartered and certified firms, or as a consultant. An accounts assistant provides administrative support to an accountant, finance manager, accounts team or accountancy firm, undertaking clerical and basic bookkeeping tasks in order to help maintain their office. While you may occasionally communicate with customers and external clients, your main duties will be working with spreadsheets, receipts and payment records, preparing statutory accounts, calculating and checking accounts to ensure payments and records are correct, sorting post and answering queries, managing petty cash, controlling credit and chasing debt and reconciling direct debits. You may then be promoted to assistant accountant. Other accounting jobs you could explore include working as an actuary, budget analyst, claims examiner, cost estimator, credit controller, financial analyst, financial trader, investment analyst, payroll administrator, personal financial advisor, purchase manager, retail banker or tax adviser, and other roles in corporate or personal finance, credit consultancy or risk management. Further sectors relevant to accountants include management consultancy, banking, insurance, business and the public sector, building societies, the stock market and working for multinational companies, not-for-profit organizations, NGOs, SMEs and the local and national government. You could also teach accounting, business or mathematics at secondary school-level and lower, but will need to pursue further studies (PhD or Doctor of Business Administration) in order to commence a career in accounting academia.